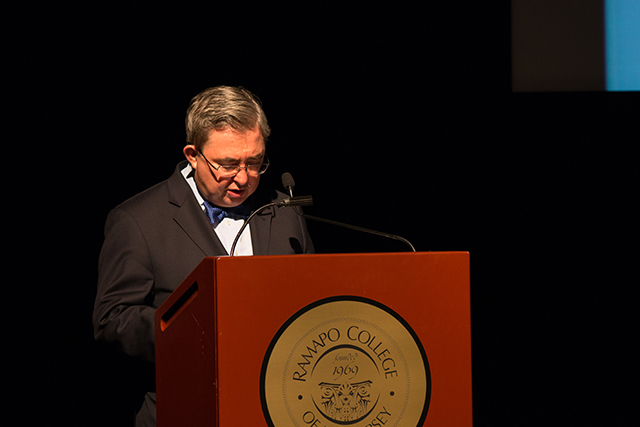 This Wednesday, Ramapo College held its annual Remembrance Day. Established in 2005 by Ramapo’s Board of Trustees, the day is meant to honor and reflect upon those in the Ramapo community who passed away during the previous year. President Peter Mercer led the ceremony. Following Mercer’s introduction, the College’s a cappella groupb 4GotteN SuitCase was invited on stage to perform “That Lonesome Road” by James Taylor. After the performance, Mercer returned to the podium and began speaking in detail of the honorees, while asking those in attendance to take a moment of silence after each eulogy. Mercer also made an announcement at the end of Dallon’s eulogy. 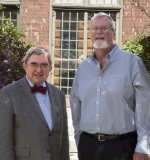 “I am pleased to announce as president that I will be recommending to the Board of Trustees that the campus greenhouse be named in honor of Professor Joe Dallon,” Mercer said. A eulogy was also delivered for Eileen Byrnes, who was a staff member with the School of Contemporary Arts. Byrnes’ late husband John was also a member of Ramapo, working in the department of Public Safety. Lorne W. Weems was another member of the Ramapo community honored during Remembrance Day. In memory of Weems, school of Theoretical and Applied Sciences faculty member Harold Katz performed a dedicational song, citing Weems’ impact on those around him and his influence as a role model for both students and his peers. Other esteemed members of the college community who were honored during Remembrance Day include Frank V. AtLee III, Mark G. Becker, Henry Bischoff, Paul Garber, Emily Geltman, Valerie Akiko Henry, Lillian McPhillips, William E. Murnion, Howard Radest and Deborah C. Rios. On the Ramapo website, galleries of past honorees can be viewed by year, and members of the college community can submit personal memories about those who have been honored during Remembrance Day.